A few months ago, when my friend Achy (whose fantastic blog you can find here) was visiting, I invited her over for a Cuban breakfast then thought better of it. For the most part, Cuban breakfast is cafe con leche and pan tostado. The coffee I could make but I have yet to find good Cuban bread north of Tampa and a latte doesn’t really justify a trek to Brooklyn. Making it an early lunch instead, I made a tortilla Española and tomato and avocado salad but wanted to offer something more. 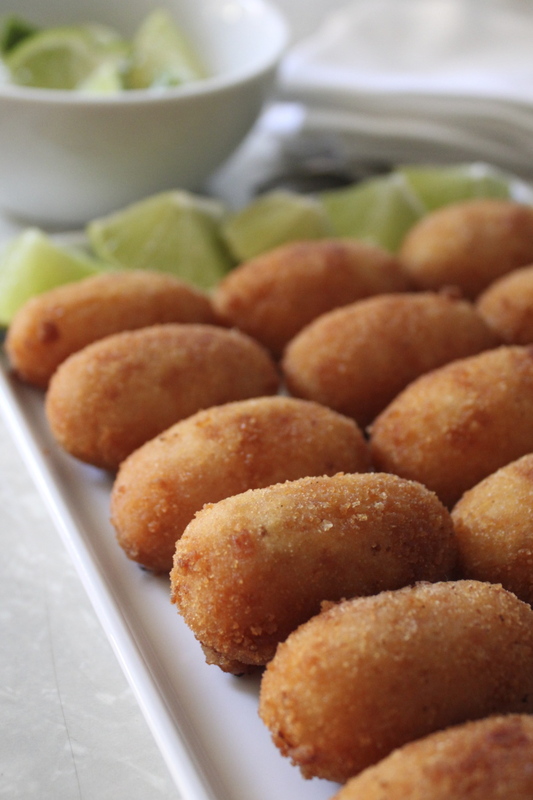 The week before, I’d planned to make croquetas for a surprise party but they were the first item dropped when time ran short. Quickly blended with béchamel sauce, they’re supposed to be an fast solution for leftover ham, chicken or seafood but I rarely take it easy on myself. Always looking for a twist or complication, I’ve made them with chicken, peppers, and hard boiled eggs, gorgonzola and Jamón Serrano, and am thinking of a mushroom and shallots combination soon (or leeks I can’t decide). 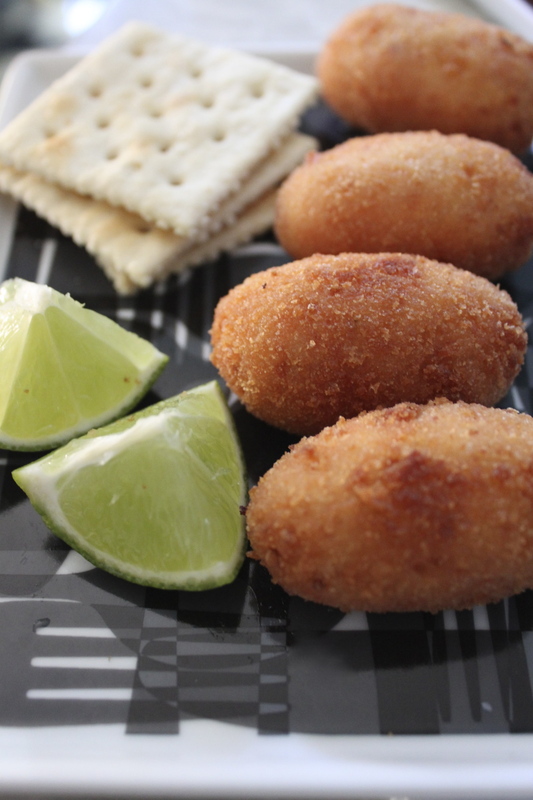 For this lunch, I wanted the same, simple ham croquetas I might have have picked up at any Cuban bakery in Miami when you’re lucky enough to find them freshly fried. With ham filling leftover from the cangrejito pastry puffs that did make it to the party and a simple béchamel sauce, I threw them together at the last minute. 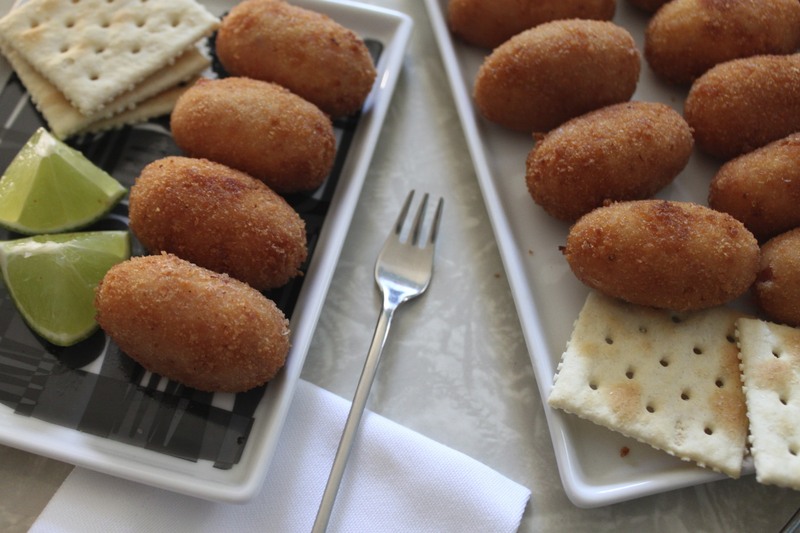 With the first bite, I knew they were the best ham croquetas I’d ever made and, with the second, realized I hadn’t written anything down and couldn’t remember exactly how I’d done it. This weekend, with a pound of cooking ham once again left behind from a kitchen fail (don’t ask), I decided to retrace the steps of the earlier batch but get it all down this time. Coming this close to home, I couldn’t resist adding the short stack of saltines and lime wedges croquetas typically come with. Except for the missing mi vidas and cariños the waitresses bring with every order, it could have been a morning at Versailles. This a very simple rendition of a fritter that can be embellished and seasoned in a million different ways. Perfect for tapas, I’m sure I’ll get more practice going into the holidays. Before frying, I heated the oil to 375 degrees, the standard temperature in most traditional recipes. Though they came out well, I think I may have had fewer eruptions if I’d lowered the heat slightly (closer to 365 degrees) which I’ll try the next time. Line a baking sheet with plastic wrap and set aside. Combine ham and mustard in a food processor and pulse until it forms a smooth paste. Melt the butter in a heavy saucepan over medium-low heat. Add the flour and cook, stirring constantly until well blended but not browned, about 2 minutes. In the meantime, gently heat the milk to a gentle simmer but do not let it boil. Gradually stir in the milk, whisking constantly until the sauce has thickened and is pulling away from the sides of the pan. Remove from heat. Add the pureed ham and mix until well combined. Season with salt, pepper and nutmeg. Pour the mixture onto the lined baking sheet using a rubber spatula to spread evenly. Bring to room temperature then cover with plastic wrap and refrigerate until set, at least one hour. Lay out 1/2 cup of flour, beaten eggs, and bread crumbs in separate mixing bowls. Dust hands with flour and spoon the béchamel mixture into walnut sized pieces and roll into desired shape, about one tablespoon per croqueta. 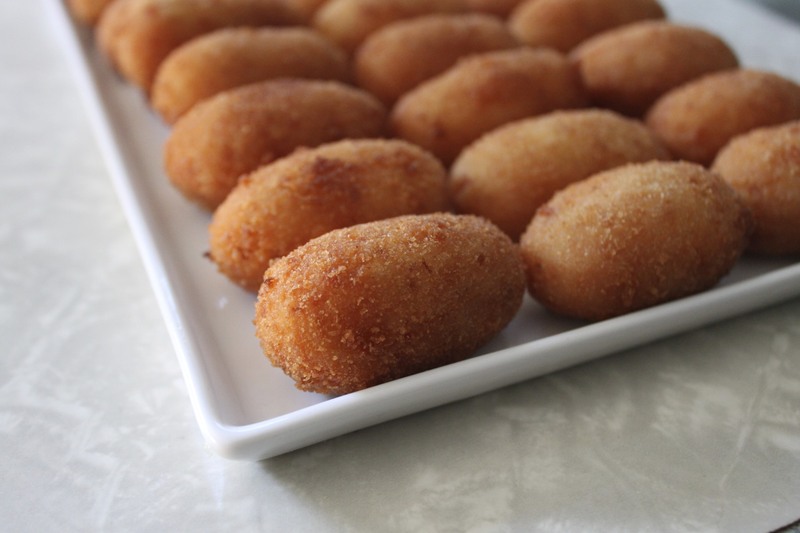 One by one, roll the croquetas in flour, drop into the egg mixture with a fork or slotted spoon, then transfer to bread crumbs. They should be completely coated in bread crumbs so they don’t leak when cooked. Add about 3″ of oil to a large heavy skillet. Heat over medium-high heat to 375°F (see header). 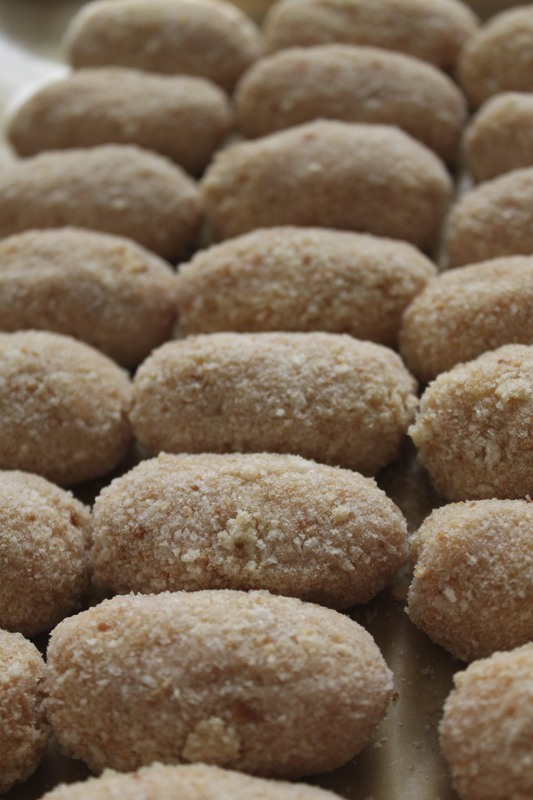 Working in batches, carefully add the croquetas. Gently turn until brown on all sides, about 2 minutes. Remove with a slotted spoon and drain on paper towels or re-purposed grocery paper bags. Serve immediately. That’s exactly like my grandmother made them and now my mom, they are my favorite. Thanks for bringing tradition and good food for all the generations that follow. Back to Cuban bread. I live in Manhattan and often food shop in NJ at a Shop-rite in North Bergen where I recently discovered Cuban bread. This market is frequented by many latinos especially Cubans. It’s pretty good bread, but of course, it must be toasted and buttered and well, you know. That’s great to know! I think I may have to get on the Bergenline soon! This is making me dream about all the croquetas I had in Spain earlier this year while eating tapas. They look super super delicious. Hi Sofia…what a great blog I love it. My mom is an excellent cook but like most Cuban moms cooking comes natural to her meaning….no kitchen gagets, no measuring, no cookbooks and no writing down receipes. Unfortunately I did not inherit her talent so duplicating her receipes is impossible…of course until you came along….thanks so much. Can’t wait to start cooking!!! Thanks! I’m sorry but there’s no print option for this platform. They copy and paste well though if you’d like to print one out. This is a very traditional Spanish dish, I didn’t know it was also popular in Cuba, or that you had jamón serrano in Cuba, at all. Jamón serrano was used in Cuba not only for sándwich but also in diferent receipes, unfortunately after Castro took over this was not longer available. We have everything and anything you can think about before 1959. Can you possibly make a video the next time you do these? It would definitely make it easier to follow. Thanks! Looking forward to making these myself.